Forbes released its annual list of the top 20 earning stars in hip-hop on Wednesday. Rap moguls Jay Z, 45, and Diddy, 46, landed on top. Diddy, for the second year in a row, claimed the highest spot on the cash countdown, with $62 million thanks to his Ciroc vodka enterprise and a host of other businesses he has ownership in. Coming in second was Jay Z, who brought home a huge slab of bacon - $53.5 million, to be exact - for wife Beyonce and daughter Blue Ivy. 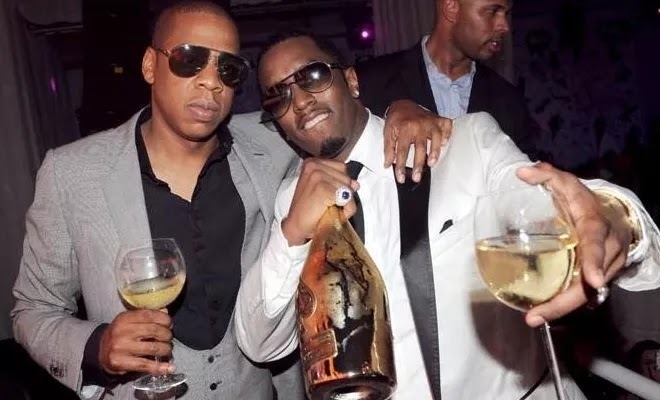 The staggering sum came primarily from his Roc Nation entertainment company, with extras like his champagne and cognac businesses adding to his bottom line. And in a case of the rich getting richer, Dr Dre who made $620 million in 2014 after Apple purchased his Beats By Dre headphones company, marking the only year Diddy did not rule the financial roost. - finished third. The Still D.R.E. rapper pocketed a cool $41 million over the past year, fueled by ongoing profits from his remaining stake in the high-end headphones company, in addition to profits from the wildly-successful film, Straight Outta Compton. Rounding out the top ten were Drake with $38.5 million; Wiz Khalifa at $24 million; Nicki Minaj, the only female to make the list, with $20.5 million; Pitbull with $20 million, Pharrell Williams with $19.5 million, Kendrick Lamar at $18.5 million and Birdman with $18 million.